The Miami Heat pulled off perhaps the greatest turnaround in NBA history this past season, under perhaps the most challenging of circumstances. After losing Dwyane Wade to free agency and Chris Bosh to a possible career-ending medical condition, it was always going to be an uphill battle. Persistent injuries along the way only increased that burden. And yet, despite an exasperating 11-30 start to the season, the Heat pulled off an unprecedented reversal in its final 41 games, posting a 30-11 mark that was good for second-best in the league and made it the first team to ever fall more than 12 games under .500 and climb all the way back to even. During those final 41 games, despite the lack of a (current or former) All-Star anywhere in the rotation, despite losing more games to injury than any other team, despite being forced to count a comically-undersized undrafted rookie and a pair of discarded free agent retreads among its starters, the Heat posted an astounding offensive efficiency (109.7 points per 100 possessions) that would, projected over the course of a full season, have ranked second best in its history. They did it by employing the most fundamental of basketball principles: drive, and kick. The Heat drove to the basket more than any other team in the NBA this season (35.1 times per game), and no single pair of teammates did it more frequently than Goran Dragic (11.9 per game) and Dion Waiters (11.0 per game). Only two players in the league averaged more drives per game than Dragic (Isaiah Thomas and Dennis Schroder) and only two others more than Waiters (John Wall and Russell Westbrook). 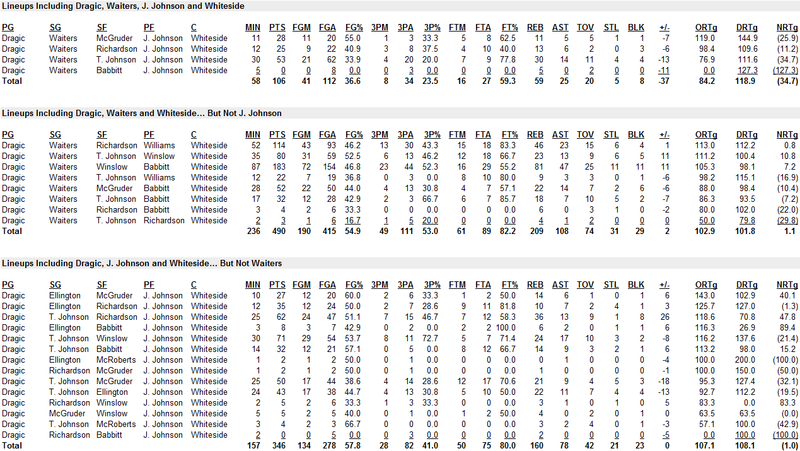 What made the philosophy work so well for the Heat was not that they were lethal scorers at the rim. They weren’t. Waiters, in fact, shot a rather awful 42.8% when driving this season. What made it work so well is that they both passed so much. When they drove, they passed the ball a combined 44% of the time. Dragic and Waiters each became exceptionally proficient at collapsing the defense to stop their penetration, then passing back out to create open looks for teammates — which for the Heat led to numerous easy chances at the rim for Hassan Whiteside, and tons of open 3-pointers for its well-spaced perimeter shooters. So, with such a strategy, it would make sense that the Heat’s 3-point shooting success would correlate strongly with its overall success. Miami shot what would be an NBA-best 41.0% on 3-pointers in its 41 wins, and what would be an NBA-worst 31.7% in its 41 losses. A full 89.1% of the Heat’s made 3-pointers this season came off assists, the second-highest percentage in the league, most of them a direct assist by Dragic or Waiters or a hockey-assist after ball rotation along the perimeter. Shocking, perhaps, for a team without a true point guard. Dragic and Waiters developed a wonderful chemistry along the way, not only because they each took the solo burden of driving and kicking to jump start the Heat’s offense off each other but also because they each became the other’s best floor spacer. Consider this: 16% of Dragic’s shot attempts this season came from spot-up 3-point chances, which he converted at a 40.4% clip… and 22% of Waiters’ shot attempts came from spot-up 3-point chances, which he converted at a team-best 43.4% clip. Considering that Waiters’ spot-up 3-pointers comprised more than a quarter of his overall point total this season, his ridiculously efficient shooting in those situations became a huge weapon for the Heat. It’s a luxury Dragic never had with Wade. Get a couple of guys who can each break down a defense and willingly and effectively space the floor for the other, pair them with a couple of sweet shooters and the league’s most imposing big, and it’s not all that hard to see how a team short on talent can still find success. That’s what happens when you create and capitalize on a perfectly spaced floor (both vertically and horizontally) on offense, and combine it with stellar defense: Dragic (0.1% below), Waiters (4.3% below), James Johnson (4.8% below) and Whiteside (2.0% below) each held the man he was guarding below his season average field goal percentage; and when they missed, Whiteside typically cleaned the glass, finishing second in the league in defensive rebounding percentage (34.9%). But when Waiters went down with an ankle sprain in mid-March, he took the offense with him. Which taught the Heat a painful but valuable lesson – that secondary playmaker was a critical part of the formula. Neither Tyler Johnson nor Josh Richardson proved particularly effective at it. Each struggled at times this season, as their roles transitioned from among the league’s best floor-spacing shooters last season (Richardson having led the NBA in 3-point shooting after the All-Star Break at 53%; Johnson having shot 41% on 3-pointers on the season, excluding heaves) to secondary playmakers. These are guys who excel with their feet set. They’re 3&D guys on steroids. They can ferociously attack the rim when the situation presents itself, but creating offense for themselves and others is not really part of their core skill-set. Ultimately, the answer came from the most unlikely of places: third-string, single-season rental forward James Johnson. In the absence of Waiters, the Heat unleashed Johnson as its supremely-versatile secondary playmaker. His reincarnation as an in-shape point-forward proved to be a severe match-up problem for opposing defenses — allowing him to effortlessly glide past bigger defenders, and power through smaller ones. Johnson did a bit of everything for the Heat this season – he led the fast-break, dished out some slick passes, knocked down some big shots, grabbed some big boards, and played some awesome defense while guarding every position on the court. He even shot a career-best 34.0% on 3-pointers. And when Waiters went down, he adjusted accordingly — ratcheting up his basket-driving to 8.2 per game over the final 10 games to compensate, passing out of it less but finishing more and with astounding efficiency (shooting 62.8% on his drives). Dragic, Waiters and Johnson each provided his own brand of fireworks to spearhead the Heat offense at various points in the season. Whether it was in transition, in isolation, or in the pick-and-roll, each player’s ability to attack the paint created easy chances at the rim and open looks for teammates along the perimeter. When they knocked them down, the Heat tended to win. When they didn’t, they tended to lose. The three didn’t actually play a whole lot together. But when they did, it was highly successful. During the second half of the season, when Dragic, Waiters, James Johnson and Whiteside shared the floor, in 121 minutes over 20 games, the team produced a staggering offensive rating of 127.2 (points scored per 100 possessions) and a staggering net rating of 24.2 (margin of victory per 100 possessions), each far and away the team’s best four-man-unit that included long-term pieces Dragic and Whiteside. Such lineups shot a combined 53.7% from the floor, and 51.1% from the 3-point line on what would be an NBA second-best 35.7 attempts per 48 minutes. The Heat went 17-3 in those games. Which would seem to make the Heat’s summer priorities rather self-evident – keep the four-man unit intact, and pair them with the best damn shooter at the small forward position they can possibly find… preferably someone who’s tall enough to ride roller-coasters (vs. Rodney McGruder), and thick enough not to get knocked over by a stiff breeze (vs. Josh Richardson). Of course, nothing is ever that simple. During the first half of the season, when those same four players shared the floor, in 58 minutes over 14 games, the 3s weren’t falling (23.5%). As a result, the Heat offense was downright awful (84.2 rating). Head coach Erik Spoelstra was well aware of the issue. He himself resisted starting James Johnson with Dragic, Waiters and Whiteside, preferring instead to pair them with the far better shooting Luke Babbitt and to utilize Johnson as a primary playmaker from off the bench. Babbitt paid that decision off by hitting some huge shots with the floor spacing that Dragic and Waiters created for him (shooting a team-best 41.4% on 3-pointers for the season). Johnson paid that decision off by joining with Tyler Johnson to become one of the most effective bench duos in the league. But while having the Johnsons excel in bench roles is a strategy which works when you’re paying them throw-away money, it’s not one that will fly when you’re paying both mid-to-upper-teen-million-dollar salaries. All of it seems to suggest that a Heat team centered around Dragic, Waiters, Johnson and Whiteside can be special if they keep breaking down defenses and keep hitting the open 3-pointers it creates, but could struggle if they don’t. The Heat, therefore, knows it needs to (re-)sign at least one secondary (or primary) playmaker to accompany Dragic, as many shooters as it can get, and preferably players who excel doing both — and preferably players who can do both from either or both of the forward positions. 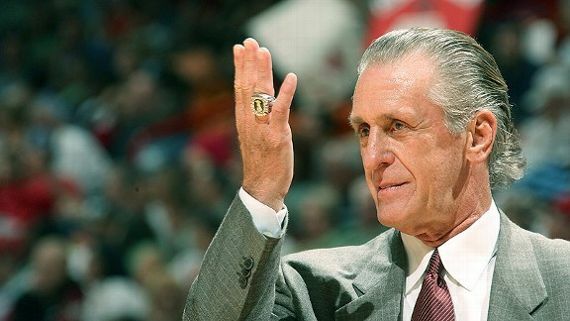 Which raises a flurry of questions about how Pat Riley and the Heat organization should tackle the summer ahead, with Waiters, Johnson and several others who are likely to catch the Heat’s attention about to hit unrestricted free agency. At a $101 million salary cap, the Heat will realistically be able to generate anywhere from $31 million to $42 million of cap space without any outside assistance (with the $10 million-plus difference dictated by the treatment of Wayne Ellington, Josh McRoberts, Luke Babbitt, Rodney McGruder and Okaro White), and possibly $50 million-plus when contemplating potential trade scenarios. How would you want the Heat to deploy that cap space? Should the Heat bring both Waiters and Johnson back? Can Waiters (39.5%) and Johnson (34.0%) each meet or exceed their career-best 3-point shooting performances from this past season if they do? Would it destroy the team’s stellar offensive efficiency if they can’t? Are you willing to take that risk? If so, how many years would you give them? Waiters is still just 25. You’d be getting prime years. But he played just 43 games this season due to injuries. Have you seen enough to bet the next four years that he’ll be productive and healthy? What if he demands it? And Johnson is 30. Will he be the same player, as athletic and as committed to his fitness, at age 34? Are you willing to accept that risk? Would you give him the full four years if he demands it? How would keeping the status quo address the Heat’s need for a starting-caliber small forward? What would be the starting lineup you envision? Would you consider the non-shooting Justise Winslow a viable alternative as a starting small forward? Would you allow Josh Richardson and Rodney McGruder to compete for the position despite their obvious physical limitations? How much cap space would it require to retain both Waiters and Johnson? Somewhere around $25-30 million? Would you stop your free agency pursuits right there, or would you take the actions necessary to create cap space closer to the higher end of the range in order to pursue other goals? 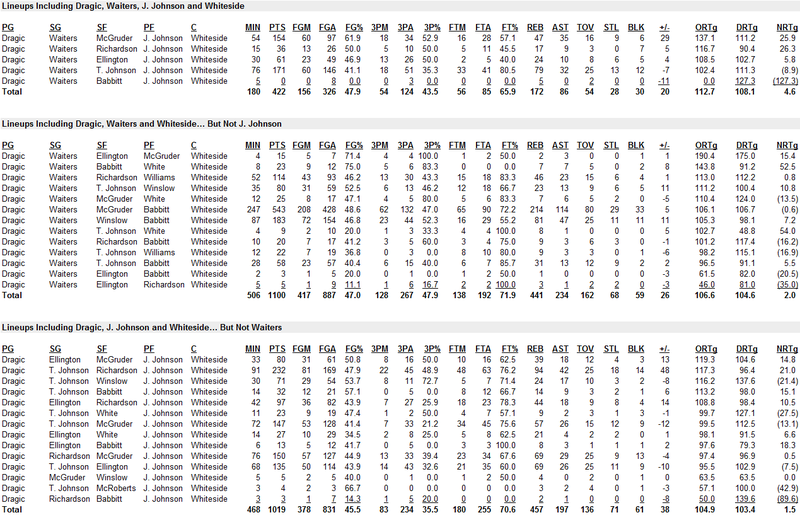 Johnson had a spectacular season, but could his shooting become worrisome for a team that relies so heavily upon it? Dual playmakers are a wonderful luxury to have. But is three overkill, if one struggles as a shooter? What if you could re-sign Waiters, and replace James Johnson with one of the game’s premier shooting big men? Someone like Toronto Raptors free agent Serge Ibaka. How much more effective could the Heat offense be with the improved spacing? With someone who possesses Babbitt-like 3-point shooting, but wrapped in the chiseled body of a man with the versatility to create offense for himself in the mid-range game, or even post up and finish around the basket? Someone who prefers to think of himself as a modern-day center who can block some shots and impose his will at the rim on defense but, with declining athleticism, not quite as much the Johnson-like versatility to chase guards around the perimeter? How perfectly does that type of player fit alongside Whiteside in the frontcourt on offense? How imperfectly does it fit alongside Whiteside in the frontcourt on defense? And how would it address the Heat’s need for a starting-caliber small forward? What would be the starting lineup you envision? How much cap space would it require to keep Waiters, and pursue Ibaka? Somewhere around $30-35 million or so? Waiters had a spectacular season, but take away his career-best 3-point shooting and what does he become? Someone who excels at breaking down defenses but struggles to finish at the rim, struggles to hit his free throws when he’s fouled, and can’t really space the floor? Someone whose playing time detracts from the development of Tyler Johnson and Josh Richardson as shooters? 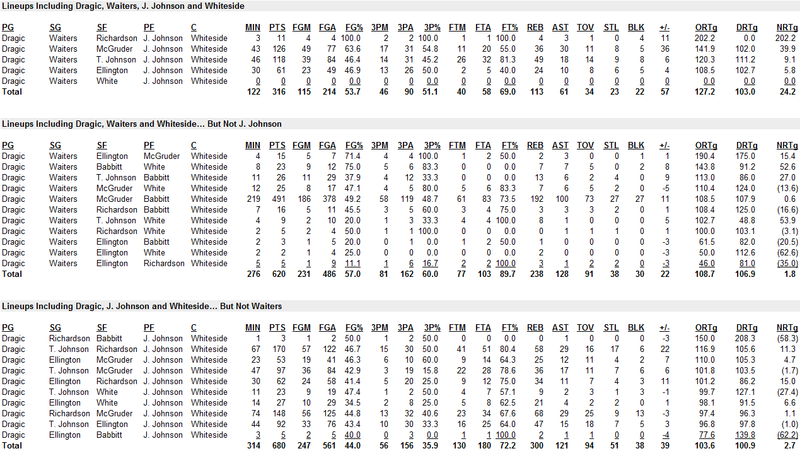 Consider this: Statistically speaking, the best five-man rotation that included Dragic and Whiteside this season also included both Waiters and James Johnson (and Rodney McGruder). But the second best five-man unit didn’t include Waiters at all. It had Dragic and James Johnson as playmakers, Richardson and Tyler Johnson as shooters, and Whiteside down low; and it produced the second best offensive rating (117.3), best defensive rating (96.4), and second best net rating (21.0) of any Heat rotation that played more than 35 minutes together. What if you could re-sign James Johnson, and replace Waiters with a player who is even more consistently efficient with his shooting, and at the same time (i) transition Richardson and Tyler Johnson back from their roles as ineffective playmakers to their roles as dominant shooters and (ii) address the team’s lack of depth at small forward? Perhaps a quiet leader who excels at everything, particularly his catch-and-shooting and perimeter defense, and always does so within the flow of the offense? Someone like Utah Jazz restricted free agent Joe Ingles. Or perhaps someone who can be a high-end scorer and shot creator if it’s needed, but doesn’t always need the ball in his hands? Someone like Denver Nuggets free agent Danilo Gallinari. How might a Goran Dragic – Josh Richardson or Tyler Johnson – Joe Ingles or Danilo Gallinari – James Johnson – Hassan Whiteside rotation look? How much cap space would it require to keep James Johnson, and pursue Ingles or Gallinari? Somewhere around $25-35 million or so? What if, rather than sacrificing one or both of Waiters and Johnson to improve the roster, you could retain both AND still bring in a significant new talent? What if you could keep both, and make a legitimate run at a player like Ingles or Gallinari? How dominant could a Goran Dragic – Dion Waiters – Danilo Gallinari or Joe Ingles – James Johnson – Hassan Whiteside rotation be? Could it join the Cleveland Cavaliers and Boston Celtics in the push for the conference’s top seed? How much cap space would it require to keep both Waiters and James Johnson, and still pursue Ingles or Gallinari? Somewhere in the range of $40-50 million or so? There are a number of high profile free agents this summer. Griffin is just one. But unlike most others, who will likely re-sign with their current teams, there is growing belief that Griffin may seriously consider other options. There was a time when Griffin was considered a top NBA player. Continuing injuries have robbed him of that potential. He’s now transitioned to a player who relies more on his skill than his athleticism. But he’s still a premier point forward. Should the Heat be interested? Griffin is going to get his $30 million max. Would you take that kind of gamble when considering his injury history? He’s a nice, high-profile name to be sure. But is he really worth it? At double the price of a perhaps similarly-skilled Johnson? Would you sacrifice both Johnson and Waiters to get him? Would he even come here if you did? What if you could get Griffin and keep Waiters? Would you do it then? And even if it were possible, how would it solve the Heat’s need for a starting-caliber small forward? What would your starting lineup be? What if, instead, you could pair Griffin with Ingles or Gallinari? How dominant could a Goran Dragic – Josh Richardson – Joe Ingles or Danillo Galinari – Blake Griffin – Hassan Whiteside starting rotation be? Could a bona-fide All-Star and a balanced starting lineup around him be the missing pieces that carry the Heat deep into the playoffs? How much cap space would it require to keep Waiters and pursue Griffin? Somewhere around $45 million or so? How much cap space would it require to pursue Griffin and either Ingles or Gallinari? $45-50 million-plus? What if you could attract Gordon Hayward? It’s a long-shot to think he’d leave Utah. Even longer to think he’d consider Miami. But what if he did? The guy is still young, and ascending. Do you even know where his talent level tops out? Should he be the single most coveted free agent target for the Heat this summer? Hayward is going to get his $30 million max. He’s probably the only top-line player within the Heat’s potential range who’s truly worth it. But that kind of money could probably buy you two of most of the other Heat free agent targets. Would you do it? What if you could get him and keep Johnson? Would you do it then? Or what if you could pair him with Ibaka or Gallinari? How dominant could, say, a Goran Dragic – Josh Richardson – Gordon Hayward – James Johnson or Danillo Galinari or Serge Ibaka – Hassan Whiteside starting rotation be? Does it have a chance in the years ahead to knock off an aging Cavaliers team for Eastern Conference supremacy? If Hayward is your single most preferred free agent target, would this be your single most preferred of any plausible full scenario? How much cap space would it require to keep James Johnson and pursue Hayward? Somewhere around $45 million or so? How much cap space would it require to pursue Hayward and either Gallinari or Ibaka? Around $50 million? There are lots of other potentially intriguing players that the Heat could pursue. But under what conditions would you actually pursue them? Would they be primary Heat targets? More of secondary targets, with potential offers dictated by whatever cap space remains after you’ve achieved your primary off-season goal(s)? Perhaps after re-signing Waiters and Johnson? Would you be willing to give up, say, Wayne Ellington to make such a signing happen, if it came to that? Potentially intriguing among those in this category of players: restricted free agent forwards JaMychal Green, Nikola Mirotic and Kelly Olynyk, as well as unrestricted free agent forwards Omri Casspi, Rudy Gay, Erson Ilyasova, Jonas Jerebko and Patrick Patterson. Perhaps the most polarizing is Rudy Gay, who will decline a $14.3 million player option to become an unrestricted free agent this summer. The Heat has had interest in Gay over the years. But he’ll be 31 years old to start next season, and he’s recovering from a complete rupture of his left Achilles tendon. Those are devastating injuries. Career-enders for many. Athleticism killers for most. What kind of player will he be when he returns? What position will he play? His natural and athletically demanding small forward position, or will he transition to more of an undersized power forward role? Do you envision him as a starter or as a backup? How much money do you offer a player like that? Over how many years? Would he accept a smaller first-year salary than the $14.3 million option he could have accepted as a mean to prove he has fully recovered? Or is he expecting a higher salary and asking potential suitors to take on faith he can be the player he was? Over how many years? More importantly, does he even fit within the criteria of a Heat need? He can be a solid go-to-scorer at times. But is he a playmaker who can create opportunities for others? Or a reliable floor spacer? He’s an intriguing name, but does he fit at all within a Heat system that was so successful this past season? How does that impact your decision-making? And how about the others? Could some of them actually fill an interim starting small forward role? Could some of them actually be a better starting power forward fit than the shooting-challenged James Johnson, who excelled from off the bench last season? Would the free agents in your scenario even be willing to come (or stay)? How much cap space would it require? What would it take for the Heat to get there? How does it dictate the Heat should handle Wayne Ellington (whose $6.3 million salary is non-guaranteed through the end of moratorium), Tyler Johnson (whose salary jumps to from $5.9 million next season to $19.2 million for each of the final two), Justise Winslow (whose development was stunted by his torn labrum, and has virtually no shot to become the type of long-term building block the Heat envisioned him to be if it can’t drastically improve his career 25.8% 3-point shooting), Josh McRoberts (who still possesses an enviable skill-set), and the rest of the Heat roster? How does it dictate what the Heat should do with its first-round pick, likely #14 overall, next month? This is a short (and overly simplistic) post which sets a basic framework for how the Heat achieved its success this past season, and then leverages that framework to pose various (but nowhere near all) alternatives for how you might want the Heat to approach the summer to capitalize on that success, what the resulting starting rotation could be, and how much it might cost to get there. Yesterday, I published a post which details how much cap space the Heat can create in various scenarios. My hope is that, utilizing the two posts together, you can pick a plan you like, and then see the moves the Heat would need to make to execute upon it. If I were making decisions for Miami Heat, my Plan A scenario would be to sign Gordon Hayward and James Johnson (for a potential starting rotation of Goran Dragic – Josh Richardson – Gordon Hayward – James Johnson – Hassan Whiteside), and my Plan B scenario would be to sign Dion Waiters, James Johnson and Joe Ingles (for a potential starting rotation of Goran Dragic – Dion Waiters – Joe Ingles – James Johnson – Hassan Whiteside). Can the Bulls surround Rose and Noah with three max free agents? Awesome post Albert! Thanks for sharing. Out of all of those scenarios you laid out, I’m most tempted to say just bring back Waiters and Johnson on reasonable contracts, maybe only 3 years for JJ and 4 for DW. Griffin and D Wade (whom you didn’t mention) are liabilities for high cost. Zach Lowe constantly points out how Ibaka is sharply declining, so not worth the 20M+ per year he’ll receive. Hayward would be a great get, but it’s tough to say that’d be likely – definitely worth a call tho. There are a lot worse outcomes than being a solid East playoff 4-5 seed over the next 3-4 years, especially considering that some of their picks are owed to others. I think the #1 priority is to sign James Johnson and Waiters hopefully for around $12 million each ($48 mil for 4 years). If that can be done, it would leave $6-$12 mil cap room for another role player, leaving most of the team intact from last year. Now as much as I hate to say it Tyler Johnson will never live up to his $19.5 mil. salary and should be traded perhaps with Josh McRobert’s (6.5 mil)and/or this year’s draft pick for a max player like Paul George, Rudy Gay, Blake Griffon, Gordon Hayward, or D. Wade. I also hate to say this but Udonis Haslem needs to give up his roster spot and $7 mil. check he draws for not even playing. His roster spot is hurting the team by keeping them from adding better player(s). I think Haslem should work with Juwan Howard and help coach the teams bigs. The Heat need his salary and bench spot to improve the team. Excellent post, as always. Where can I acquire your encyclopedic knowledge of NBA collective bargaining, finances, ect. ? I think that the only realistic best case scenario is retaining JJ and DW, and signing Galo/Ingles/Gay. That’s only is DW and JJ take considerable pay cuts which i think it’s very possible. Then after that hope for a mid season trade for an all star. I don’t see any top FA leaving that much money on the table to switch teams.